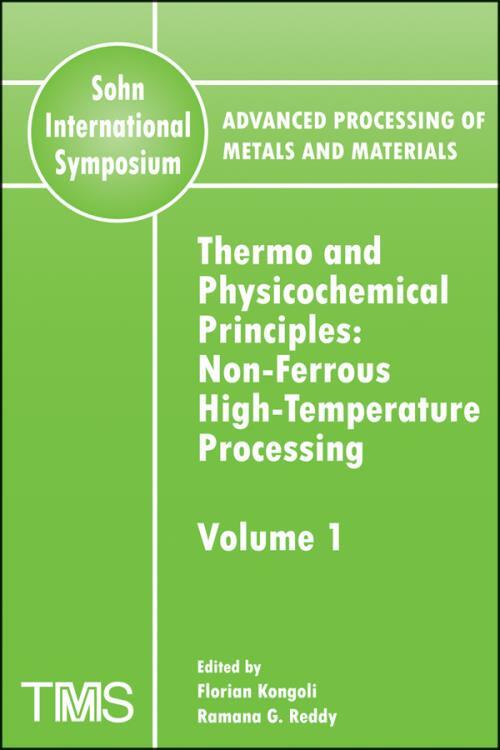 This volume focuses on proceedings from the Sohn International Symposium on thermo– and physicochemical–principles of nonferrous high temperature processing. Topics include kinetics; thermodynamics; thermodynamics and physical properties; waste treatment; and recycling and recovery. From the <a href="[external URL] target="—blank">2006 TMS Fall Extraction & Processing: Sohn International Symposium, held August 27–31, 2006, in San Diego, California. VOLUME 1: THERMO AND PHYSICOCHEMICAL PRINCIPLES: NON–FERROUS HIGH–TEMPERATURE PROCESSING. Professor H.Y. Sohn – Biography (R.G. Reddy). It Is All About Energy (P.R. Atkins). The Precious Art of Metals Recycling (F. Vanbellen, and M. Chintinne). Nonferrous Metal Recycling in Korea: The Present and the Future (K.–I. Rhee). The Role of Processes Modeling in Iron and Steelmaking (P.C. Chaubal). Liquidus Relations of Calcium Ferrite and Ferrous Calcium Silicate Slag in Continuous Copper Converting (F. Kongoli, I. McBow, A. Yazawa, Y. Takeda, K. Yamaguchi, R. Budd, and S. Llubani). Recent Developments in Copper Hydrometallurgy (Abstract Only) (J.O. Marsden). Remembrance of Academic Mentors and Early Associates (H.Y. Sohn). Kinectic Studies on the Soda–Ash Roasting of Titaniferous Ores for the Extraction of TiO2 (A. Lahiri, E.J. Kumari, and A. Jha). Kinetic Modelling of MnO Reduction from Slags by Dissolved Carbon in Liquid Iron (J. Safarian, L. Kolbeinsen, and O. Grong). Using Sohn′s Law of Additive Reaction Times for Modeling a Multiparticle Reactor. The Case of the Moving Bed Furnace Converting Uranium Trioxide into Tetrafluoride (Keynote) (F. Patisson, B. Dussoubs, and D. Ablitzer). Physicochemical Criteria on the Mechanism of Gas–Solid Reactions Used in Extractive Metallurgy (Keynote) (Abstract Only) (A. Bohé, and D.M. Pasquevich). Modelling of Gas–Solid and Solid–Solid Reaction Kinetics (Invited) (D. Sichen, and S. Seetharaman). Oxidation of Molybdenite by Water Vapor (E. Blanco, H.Y. Sohn, G. Han, and K.Y. Hakobyan). Oxidation Removal Behavior of Boron and Local Nonequilibrium Reaction Field in Purification Process of Molten Silicon by the Flux Injection Technique (Keynote) (M. Tanahashi, M. Sano, C. Yamauchi, and K. Takeda). Effects of Mass Transfer in Evaporation Processes of Alloy Components in Vacuum Processes (L. Blacha, and A. Fornalczyk). Activities of Lead and Zinc Oxides in CaO–SiO2–FeOX–AlO1.5 Slag (Keynote) (K. Yamaguchi, M. Kudo, Y. Kimura, S. Ueda, and Y. Takeda). Liquid Miscibility Gap in the Ag–Ag2S System (R.H. Eric). Solubility of SO3 in Na2SO4 Melts and Thermochemistry of the Na2SO4–Na2S2O7 System (Invited) (R.Y. Lin, and J.F. Elliott). Review of the Thermodynamic Properties of Binary Solid Antimonides (Invited) (M.E. Schlesinger, and S. Jacob). Predicting of Sulfide Capacities of Industrial Lead Smelting Slags (Invited) (B. Derin, O. Yücel, and R.G. Reddy). Hydrogen Atoms as Metallurgical Reductants The Potential and the Difficulties (D.R. Sadedin, W. Zhang, A.K Kyllo, and N.B. Gray). Metal/Slag Equilibrium of Ca and Al in Silicon (C. Takano, J.B. Ferreira Neto, and E.C.O. Pinto). Thermodynamic and Kinetic Properties of Copper–Sulfur–Oxygen Melt (V.A. Bryukvin, and V.M. Paretsky). Reduction–Leaching of a Local Barite Ore for the Preparation of Fine Grain Barium Sulphate and Carbonate (K.A. Elbarawy, I.A. Ibrahim, A.K. Ismail, and A. Eltoni). Phase Relations and Activities in the Cu–Fe–S–X and Cu–Fe–S–C–X (X = As or Sb) Systems and Distribution of Precious Metals Relating to Reduction Smelting of Copper (Keynote) (K. Itagaki, L. Voisin, and D. Mendoza). Volatilization Behavior of Minor Elements during Non–Isothermal Oxidation of Copper Concentrate Particles Falling in One–Dimensional Laminar Gas Flow (Invited) (H.–S. Sohn, Y. Fukunaka, T. Oishi, and Z. Asaki). Thermodynamics of Tapping Molten Copper (S. Wright, F. Jorgensen, and A. Campbell). Thermodynamic Modelling of Minor Elements in Copper Smelting Processes (C. Chen, L. Zhang, S. Wright, and S. Jahanshahi). Activity of the Components in Metallic Melts, Containing Copper and Metals of "Iron Family" (L.B. Tsymbulov, E.Yu. Kolosova, and L.Sh. Tsemekhman). Freeze Linings in Zinc Fuming Processes (K. Verscheure, M. Van Camp, B. Blanpain, P. Wollants, P. Hayes, and E. Jak). On the Interrelation of Solid and Liquid States in Sulphide Systems Containing Cu, Ni, Co, Fe and Determination of the Metallisation Level of the Components in Melts (L.B. Tsymbulov, and L.N. Yertseva). Thermodynamics Analysis on Reductive–Matte Smelting of Sulfide Ore of Lead, Antimony and Bismuth Which Using Ferric Oxide as Sulfur Fixed Agent (C. Huang, C. Tang, Y. Chen, M. Tang, and D. Zhang). Recovery of Metals from Steelmaking Dust by Selective Chlorination Evaporation Process (Keynote) (H. Matsuura, and F. Tsukihashi). A Study on the Characteristics of Ceramic Support Manufactured by Spent Foundry Sand/Loess (S.–W. Rhee). Characterization of Electric Arc Furnace Slag as Construction Material (K.–S. You, N.–I. Um, G.–C. Han, and J.–W. Ahn). Processing of Silverbearing Scrap (V. Bredykhin, O. Shevelev, E. Kazban, V. Kostjuk, and V. Kushnerov). Recycling Nonferrous Oxides in Iron and Steel Melting (S. Lekakh, D. Robertson, S. Rimoshevsky, and V. Tribushevsky). Reduction of Zinc Oxide with Various Additives (B.–S. Kim, J.–T. Park, J.–M. Yoo, M.–S. Kim, and J.–C. Lee). The Fundamental and Frontier on Resource Recycling of Nonferrous Metals (Abstract Only) (G. Xueyi). Evaluation of Efficiency in Zinc Recovery from Waste Materials (S.M. Taghavi, and M. Halali). Processing the Ni– and Cr–Bearing Oxidized Scarfing Granulates with Liquid Cast Iron (V.M. Sokolov, V.V. Gorbenko, I.A. Vinnik, and O.M. Mekhed). A 2–D Mathematical Model of On–Grate Municipal Solid Waste Combustion (A. Asthana, Y. MTnard, P. Sessiecq, F. Patisson, and D. Ablitzer). Research on Separation and Regeneration of Waste Acids from IT Manufacturing Process (J.–W. Ahn, J.–Y. Kim, C.–H. Shin, J.–Y. Kim, and J. Shibata). Desulfurization with Hydrogen Production by BS Process (N. Sato, H. Kanazawa, E. Shibata, T. Nakamura, S. Tomisaki, H. Kuroda, and H. Shiraishi). Re–Use of Muds from Glazing and Pressing Lines of Ceramic Tile Industry in Wall and Floor Type Formulations (A. Kara, B. Kayaci, and K. Kayaci). Chloride Capacity in FeO–Fe2O3–SiO2 Molten Slag at 1523 K (Keynote) (Y. Yamashita, A. Fuwa, and F. Tanaka). Usability of Industrial Ashes in Cement Production as Pozzolanic Materials (T. Kavas, B. Karasu, and O. Arslan). Basic Principles of Environmentally Sound Electrochemical Technology for Processing Sintered Carbide Scrap for Hard–Alloy Industry (A.V. Tarasov, V.A. Bryukvin, A.A. Palant, and O.M. Grachova). Use of Borax Solid Wastes in Diopside Based Glass–Ceramic Floor Tile Glazes (B. Karasu, G. Kaya, and O. Ozdemir). Utilizing of Borax Solid Wastes in Roof Tile and Brick Bodies (G. Kaya, B. Karasu, and E. Karacaoglu). FERRO ALLOYS AND TITANIUM EXTRACTION. Phosphorus Distribution between Metal and Slag Phases Pertinent to Ferromanganese Smelting (Keynote) (H. Saridikmen, C.S. Kucukkaragoz, and R.H. Eric). The Effect of Carbon Material Properties on the Reduction Kinetics of Manganese and Silicon from Slag to Metal (Abstract Only) (G. Tranell, S.G. Gaal, D. Lou, J. Safarian, L. Kolbeinsen, and M. Tangstad). The Importance of the Slag Phase in Electric Smelting of PGM Containing Sulphide Concentrates (R.H. Eric). Tracking Chromium Behaviour in Submerged Arc Furnace for Ferrochrome Production (Y. Xiao, Y. Yang, and L. Holappa). Selective Separation of Rare–Earth Oxides from Titaniferous Ores during the Production of High–Grade Synthetic Rutile (Keynote) (E.J. Kumari, A. Lahiri, and A. Jha). Reduction Behaviour of Chromite in the Presence of a Hydrocarbon Gas (M. de Campos, and R.H. Eric). Prereduction of Chromite Agglomerates (C.S. Kucukkaragoz, and R.H. Eric). Carbothermic and Magnesiothermic Reduction of Titanium Dioxide A Thermodynamic Analysis (D. Ghosh). Thermal Properties of Bulk Glassy Alloys (Keynote) (Y. Waseda, H. Shibata, and H. Ohta). The Calculation of Thermodynamic Properties and Phase Diagrams of Binary Alloys on the Basis of Chrome (M.I. Zinigrad, K.Yu. Shunyaev, and A. Lugovskoy). Technology for Production of Aluminum Alloys (A.V. Tarasov and V.P. Shamshev). Boron Removal in the Solidification Refining of Si with Si–Al Melt (Keynote) (T. Yoshikawa, and K. Morita). Hard Anodizing on High Temperature Aluminum Alloys Part 1 (L.M. Lerner). The Physical and Mathematical Model of Aluminium Refining Process in Reactor URO – 200 (M. Saternus and J. Botor). Using General Regular Solution Model to Obtain Analytic Express of Solution Excess Properties from the Ternary Alloy System (R. Li, G. Xie, and X. Tang). Distribution of Precious Metals (Au, Pt, Pd, Rh and Ru) between Copper Matte and Iron– Silicate Slag at 1573 K (H.M. Henao, K. Yamaguchi, and S. Ueda). Effect of Al2O3 or MgO Addition on Liquidus of FeOX Corner in FeOX–SiO2–CaO Slag at 1250 and 1300 °C (H.M. Henao, H. Ohno, and K. Itagaki). Thermoanalytical Study on the Oxidation of Sulfide Minerals at High Temperatures (M. Pérez–Tello, S.E. Pérez–Fontes, L.O. Prieto–López, F. Brown, and F. Castillón–Barraza). Phase Relations and Activity of Iron Oxide in the FeOX–CaO–SiO2 System at 1300 1400 °C Under Various Partial Pressures of Oxygen (H.M. Henao, and K. Itagaki). Fluid Flow Effects in Electromagnetically Levitated Droplets (Keynote) (R.W. Hyers). Equilibrium Distribution of Selenium and Tellurium between Calcium Ferrite Slag and Alloys (M. Johnston, S. Jahanshahi, and F. Lincoln). Phase Equilibria in Ferrous Calcium Silicate Slags at 1250 °C and an Oxygen Partial Pressure of 10 6atm (S. Nikolic, P.C. Hayes, and E. Jak). Measurement of Physical Properties of FenO–MgO–CaO–SiO2 System (C.–f. Zhang, and X. Dai). Korea Institute of Geoscience and Mineral Resources.